Medicare Compliant 3-Pair Program | Marathon Orthotics, Inc.
Get all three pair at one time for one low price. Marathon Orthotics, Inc. offers hand-crafted custom Medicare Compliant Diabetic 3-Pair orthotics Code A5513, as well as prefabricated (aka heat moldable) Medicare Compliant Diabetic 3-Pair orthotics Code A5512. For your convenience, your patient’s annual allotment is provided at one time and at one price (3 pair). We will fit the 3 pair of custom Medicare Compliant Diabetic orthotics to your patient’s shoes so you do not have to! In an effort to ensure a proper fit, please provide a photo copy or tracing of the insole of the shoe. Simply providing the patient’s shoe size can be misleading because of the various shapes and sizes of different brands and styles of shoes. To accommodate your patient, cut-outs and depressions can be added at no extra charge. Met pads (aka met cookies) or met bars are available for a nominal fee. Note: we can now fit your orthotics to Dr. Comfort® brand shoes, as long as a shoe size is provided. 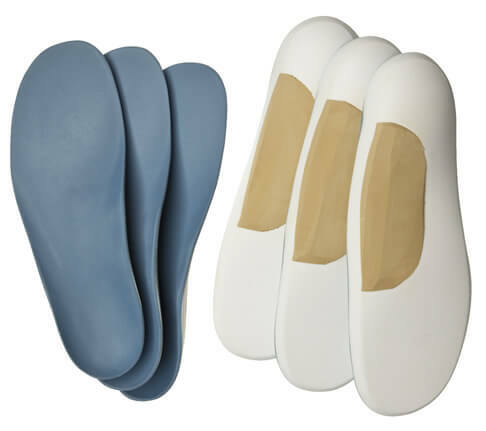 To order the custom 3-Pair orthotics, simply check Medicare Compliant Diabetic Inserts/3-Pair Custom on our regular prescription form or Custom Diabetic 3-Pair Code A5513 on the Diabetic Footwear prescription order form.